And you don’t have time to make something elaborate for dinner. Or spend hours trying to find an AIP-friendly recipe to follow. But that doesn’t mean you have to eat the same quick ‘n’ easy go-to meals over and over again. Just keep this list of 30-minute dinner recipes handy. You can serve these as a starter (in smaller portions) or eat them as a main dish. They might be light on the stomach but these options are full of flavor. Pair these patties with AIP Dinner Rolls for the perfect AIP burger and bun. These dishes are filling and satisfying even though they’re quick to make. You can read through the list of recipes here or download it to read later by clicking on the green button below. Ingredients: avocado oil, yellow onions, balsamic vinegar, pork stock, salt, bay leaves, thyme. With only a few ingredients, this rich onion soup is nutritious, filling and ideal if you are cooking on a budget! Some onion soup recipes end up quite sweet, but the addition of the balsamic vinegar helps to enrich the flavor and cut through the sweetness of the onions. Once the soup is blended, it has a fantastic smooth texture and would also make an excellent gravy for steaks or chops. Ingredients: chicken broth, fresh ginger, fresh turmeric, garlic, fish sauce, chicken, shiitake mushrooms, green onions, carrot, sea salt, zucchini noodles, Paleo Sriracha (optional). It is well known that chicken soup is full of the nutrients you may need when you are feeling a bit down, have a cold or flu or just need a hug in a mug! If you are ill, the heat from the ginger can help you feel better in no time and turmeric can also help to heal you. Take the time to infuse the broth if you can because it really makes a difference to the flavor. Ingredients: avocado oil, leeks, garlic, seafood or chicken broth, thyme leaves, salmon, coconut milk, salt. This dish is great if you like cream soups but want to be dairy-free. The creaminess comes from the coconut milk and makes a lovely base for the salmon. The leeks give a subtle sweetness and are not a strong vegetable, which is a good idea as some salmon has a really delicate flavor. Leeks are perfect for freezing – just slice or chop and pop them in a bag, and then you will have them ready-prepared for soups and stews. Ingredients: garlic, artichoke hearts, sea salt, parsley, extra virgin olive oil, chicken breasts, baby spinach. Roasting garlic gives it a surprising sweetness and totally different flavor to normal cooked garlic. With the stuffing being made with the roast garlic and artichoke hearts, it has a smoother texture which sets off the texture of the chicken. If you use wooden skewers to secure the chicken breasts then you are better to soak them first, but using metal skewers can help to cook the chicken more evenly as they carry the heat to the center of the meat. Ingredients: pomegranate seeds, chicken meat, avocado, spinach or other salad greens, sea salt, extra virgin olive oil, orange. Here is a great example of how we can enjoy food with our eyes as well as our mouths! The combination of colors and textures is amazing and the pomegranate adds a sweet juiciness to the dish. This salad tastes great with different salad leaves too so you could try using arugula to continue the Mediterranean flavor of this dish. Ingredients: chicken thighs, zucchini, carrot, daikon radish, olive oil, balsamic vinegar, ginger. Because chicken thighs have a central bone, they have a stronger flavor than chicken breast, making them perfect for a tasty, low-carb meal. They can also be cheaper, so are ideal if you are on a tight budget. These thighs can be served with cauliflower mash, but cooking them with vegetables can give you a great meal on their own. If you don’t have the veggies listed here then just use what you have. Ingredients: ground beef, fresh rosemary, fresh thyme, fresh sage, sea salt, cooking fat. Here is a quick and easy recipe for delicious breakfast patties, which can give you the protein you need to start you off in the morning. Simply mix the ingredients, form them and cook! These also go well cooked outside on the grill and are loved by even the youngest members of the family, so are a great idea for a family lunch. These patties can be frozen raw, but it is a good idea to separate them with layers of parchment first. Ingredients: ground beef, salt, fresh oregano, summer squash, garlic, mushrooms, whole black olives, bacon, fresh basil, meatballs. Spaghetti and meatballs is another go-to meal for many students and was served in our house for a Friday night teatime treat, so why not give this healthy option a try! When you are forming the tasty meatballs you might find it easier to do if you wet your hands first and you really will taste the difference if you decide to add the olives as they give the dish another level of richness. This recipe is a great way to use up leftover roast beef, but any thin-cut steak could be used. This dish has its roots in Chinese cuisine and this is shown by the use of garlic and ginger. This is a filling and satisfying dish to serve and can either be presented on its own or served with zucchini noodles. 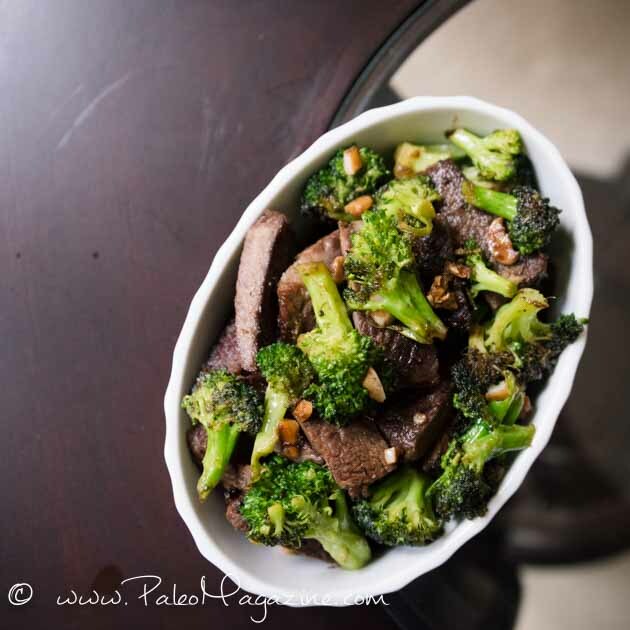 Just like any other stir-fry recipe, this meal can be ready to serve in a matter of a few minutes, so it is ideal for a quick meal at the end of a busy day. There is an authentic Thai flavor to this dish, thanks to the lime, fish sauce and mint, making this an ideal option for an Eastern-inspired dinner. Lettuce wraps are becoming more popular now as they make a great vessel for eating many kinds of meats and because this is ‘finger food’ it always goes down well with the kids too! Ingredients: steak, baby arugula, lemon, extra virgin olive oil, sea salt. This salad is so quick to make yet it is an impressive dish – perfect for serving at the end of a busy day or even to friends at a dinner party. The arugula has a lovely spicy taste which goes really well with the steak and because you do not have too many ingredients, this meal is a simple one which allows you to enjoy the steak without it being overpowered by stronger flavors. 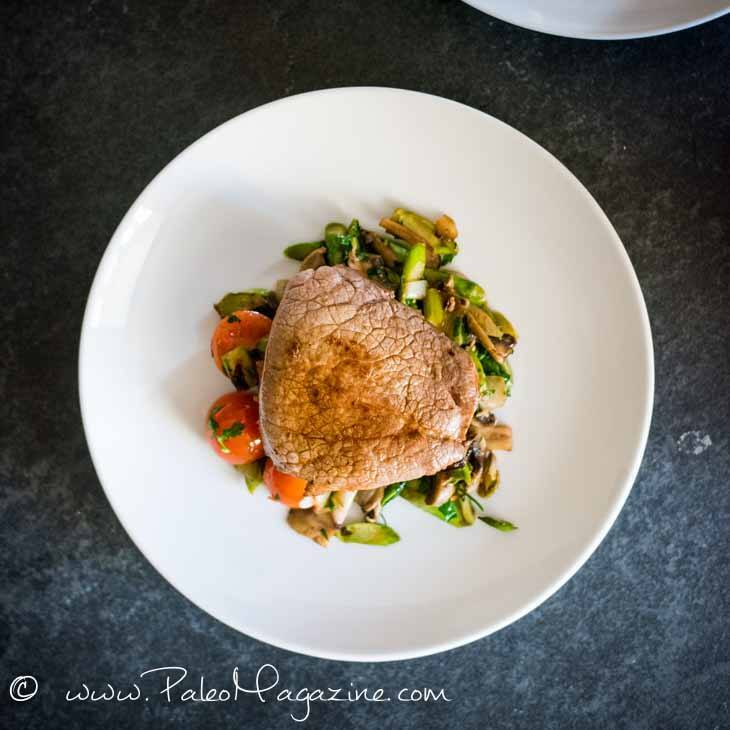 Ingredients: beef medallions, asparagus shoots, button mushrooms, onion, parsley, ginger, coconut oil, salt. It is always a good idea to season steak first before you cook it, then the action of cooking helps infuse the steak with the flavors. There is a freshness to the sauté from the asparagus and parsley which complements the beef really well. This is a simple recipe that lets you emphasize the flavor of the beef. If you don’t have button mushrooms then just use whatever ones you have. Ingredients: lamb, leeks, coconut oil, garlic powder, sea salt, coconut cream, lemon zest. These burgers are a great idea for lunch or dinner, especially if you have access to good-quality lamb. They are meaty and have a sweetness from the cooked leeks, but this is completely transformed if you add the lemon cream on top. If you really don’t like lamb you can use this recipe with beef instead. Here is a quick and easy bacon recipe that would be perfect for dinner after a hard day at work. After all, who doesn’t like bacon!! It adds such a wonderful flavor to the veggies in this stir-fry and gives you a tasty and satisfying meal in just a few minutes. If you don’t overcook the coleslaw mix you also end up with a great mix of textures too. Ingredients: petite bay scallops, bacon, zucchini, garlic powder, green onions, lemon juice, sea salt. If you dry the scallops thoroughly before you cook them and make sure the pan is very hot, you avoid the risk of them turning to rubber before your eyes. Scallops have a subtle flavor that goes so well with pasta, or in this case, zucchini noodles. The salty bacon adds even more flavor as you are cooking the scallops in the bacon fat, allowing the flavors to mingle in the pan. Zucchini noodles are so easy to make with a spiralizer and can taste even better than pasta. Ingredients: salmon filets, ghee (use avocado oil for AIP), garlic, lemon juice, salt, lemon slices. Salmon is one of the healthiest fish you can eat, packed with omega 3 and healthy fats, but because it is fatty, it takes strong flavors like ginger to help cut through this. This dish looks so good and yet it can be ready in half an hour, so it would make an impressive meal for a dinner party or for a family lunch. Cooking the salmon in foil helps the fish to absorb all the extra flavor of the garlic and lemon too. Ingredients: carrots, parsnips, bacon fat or lard, coconut milk, fresh thyme leaves, lemon zest, salt. This side would be perfect served with chops, sausage or even fish – it is so versatile! The sweetness of the carrots is offset by the lemon zest which gives the dish a fresh and zingy flavor. In bygone days, mash was always potato, but there are plenty of other options today. This is also a great way to encourage the children to eat vegetables without them realizing! Ingredients: green plantain, extra virgin olive oil, salt, coconut milk, cassava flour. If you are holding a dinner party, just imagine how impressed your guests would be if they knew you had even made the rolls yourself! These are ideal served with soups or stews and are best when they are warm. These dinner rolls are so useful if you are feeding anyone with allergy issues as they are nut, grain and gluten-free, yet still taste delicious. Ingredients: arrowroot starch, coconut flour, baking soda, cream of tartar, sea salt, olive oil, water, beef tallow. This recipe gives you the choice of soft or crispy tortillas, whichever are the family favorites in your household. They look and taste like traditional ones and can be stuffed with your choice of filling, beef, chicken, pulled pork and whatever vegetables you like. If you are hosting a family dinner, why not serve the toppings in separate bowls and let everyone stuff their own tortillas with their favorites?